Do your students have to make an appointment to meet with you? Go online! Google Calendar Appointments Slots allow your students to schedule an appointment with you during your preset time slot. 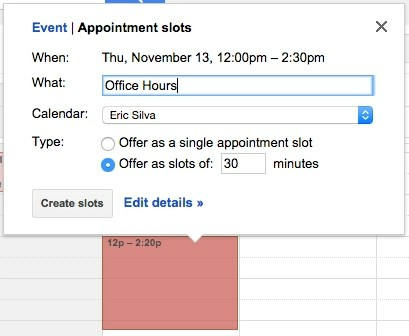 From your Google Calendar create your office hours event and select Appointment Slots. Enter your appointment name, calendar, and appointment type. Click Edit Details to provide additional information such as a location and description. Share the calendar’s appointment link with your students. NOTE: Guest scheduling isn’t available. All users will need to signin with their Google Account. From the main Google Calendar page click the slot you would like to cancel. Select your requested appointment time slot. From the main Google Calendar page click your appointment. Click the Cancel appointment button. Is there a way to embed this into Blackboard Learn? Hi Sue, I haven’t tried embedding it into Blackboard before, but you should be able to use an iFrame code. If you create an item or blank page, navigate to the HTML button in the text editor and paste the code below. You’ll just need to paste the Google Calendar Appointments URL in the space provided. You can also adjust the height and width to your liking.